1. Iona, St. Martin's Cross. 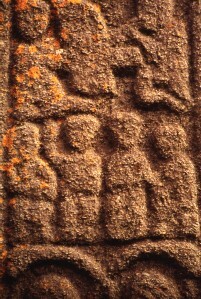 West Face, Detail of Psalmist and David and Goliath. W3 (i) 4 figures, 2 pairs, pair one, one bigger and one smaller, (David and Goliath) Old Testament. 1 Sam. 17:49. W4 Musician seated with harp, facing kneeling figure with multiple pipe, small triangular object at foot of panel. David and his musicians/ David playing the harp? Psalms. Old Testament. I Sam. 16:19.